Don’t brush your way into a corner. 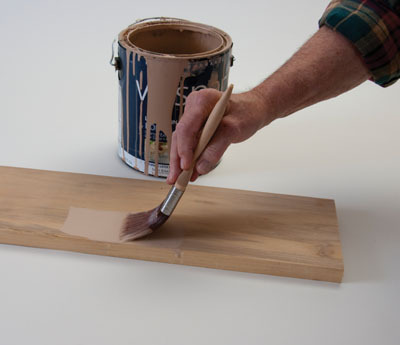 Use these easy tips for choosing the right paint brush to get the finish you’re looking for. It’s supremely easy these days to buy a paint brush. Walk into any building supply store, and you are faced with a choice of brushes that range in price from just a few cents up to 50 bucks or more. Each brush is dedicated to a type of work, but, as with most things, you tend to get what you pay for, although price extremes aren’t always good criteria for judgment. The first point in judging whether or not you need pay a little or pay a lot is to determine the kind of finish being applied. Paints can generally be applied with almost any type of brush, although using natural bristles with water-based finishes of any kind is not practical. While many pros prefer natural bristles, china and ox and badger and skunk-bristle brushes are usually more costly, often much more, than synthetic brushes of excellent quality. When that’s added to the fact that water-based finishes quickly cause swelling in natural bristle brushes, those brushes are almost one-time use tools—not handy or economical. The type of coating work to be done is another point. Painting basement walls needs one kind of brush, while laying a shellac finish on a hardwood project demands another. The steps in between are filled with natural and synthetic bristle types. Many of the natural bristles are manipulated before being set in the material that binds them inside their metal ferrules. Natural bristle manipulation is normally confined to cleaning and straightening. Synthetics are born already manipulated, but particular fibers, notably duPont’s Chinex, are sometimes pushed, pulled and prodded a bit more to make sure a brush carries the load of coating to the proper spot and lays it on as smoothly as possible. Looking over your own needs, what kinds of brushes should you have on hand? It depends. Shown is a natural badger-bristle brush as well as a polyester-bristle brush. Note the extra length of polyester bristles and the sharp tip for cutting in. If you’re a woodworker, you’ll need some really great varnish/shellac applicators, usually in the form of natural bristle brushes. For the home remodeler and general DIY’er, synthetic bristles in one of the wildly varying classes is best. For the person who likes to clean keyboards and similar items, a cheap, soft-bristled brush is best. Selecting a paint brush is not simple, but some start-up ideas may be a great help. First, avoid extremes. Why spend $50 when a $25 brush is more than sufficient? Professional quality, natural-bristle brushes may have a combination of badger, hog ear and skunk bristles. 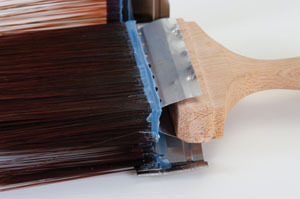 Synthetic-bristle brushes, such as this nylon/polyester brush, provide an economical solution for most painting tasks, especially for water-based coatings. Second, play to type. Natural bristle brushes don’t work well for all-around work. Synthetic bristle brushes are great for water-based paints and are almost as good as natural bristle types at laying on clear finishes. Avoid using the same brush for clear finishes and paints, though, which could lead to problems with the pigmentation of clear finishes or bits of clear finish making bumps in the surface of painted finishes. Third, clean your brushes well, and store flat once they’re dry. This brush with the ferrule opened shows epoxy plus stainless steel holding the bristles firmly in place. With proper care and maintenance, a quality brush can last for years. Fourth, keep a variety of brushes on hand. That 4-in. house-painting brush is great for all those outdoor jobs on your siding, but it isn’t much help when you’re trying to lay enamel on a window frame, indoors or out. 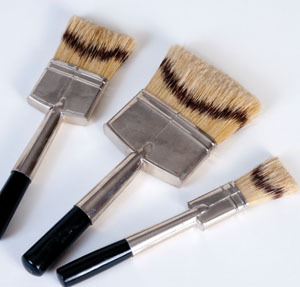 Check the various brush manufacturers to see what shapes and sizes are available. A good general line of brushes from a top maker—Purdy, Corona, Wooster, Maryland Brush, among others—has sizes from 1-1/4- to 4-in. (Corona offers 5- and 6-in. widths in specialty professional brushes and Wooster has 6-in. stucco brushes). Look around. Buy brushes as they’re needed but also try to think of times you might need a good paintbrush, without the time to go shopping. These are handy items that are often not considered on an everyday basis. After all, how often do we touch up a room or a house? It’s nice to have on hand a good 4-in. 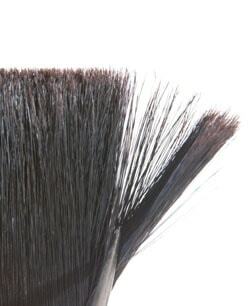 wall brush in a top synthetic, a large trim brush (2-1/2- to 3-in.) in synthetic bristle (or natural bristle, if oil-based enamel is used to increase attractiveness and durability), and a smaller 1-1/2- to 2-in. trim brush with a slanted tip. You’ll be about as ready as anyone outside professional painters. 1” to 2”: Use these to cut in around windows and trim such as moulding. 2-1/2” to 3”: General surface painting; cutting in for walls. I like the 2-1/2-in. for baseboard moulding. I’m also clumsy enough to run a strip of 2-in. blue masking tape along the floor for such work. The tape may also serve to hold painter’s film or a tarp in place to help prevent spattering and drips. 4”: Use for large areas, walls and exterior. Smaller brushes, usually 1-1/2- to 2-1/2-in., may be found with slanted tips. These are excellent for cutting in around window sash and panes. They also do well with other trim painting jobs. Some trim brushes even have angled handles. Additional brush types are found in most building supply and paint stores, ranging from round, soft, short-handled stencil brushes on to oval and round brushes in most bristle types. Clear-finish brushes, especially those used for shellac, need to be able to hold a lot of very light liquid. Alcohol is the carrier for shellac, so top results need a brush that has good bulk. Specialty brushes with natural bristles are intended for the finest finishes. This clear-finish brush utilizes badger, skunk and hog bristles to beautifully spread Danish oil for a very smooth coating. The one that works best for me is sold by Lee Valley (www.leevalley.com), and contains badger, skunk and hog (china) bristles. Clear finish brushes should be easy to load and have an easy flow so the finish goes on smoothly. The bristles are set in hard rubber, and the brushes come in 1-, 2- and 3-in. sizes. They are expensive, though, so buy only when you have a need. For heavier varnishes and lacquers, it’s possible to use top quality brushes such as Purdy’s Syntox line. They’re claimed to be 20-percent softer than ox hair brushes, with about five times the durability. If natural fiber is your preference, Purdy has their genuine Ox hair line. The brushes are sized in 1/2-in. increments from 1 to 3 in., and carry a combination of ox hair and specially selected china hog bristle for extreme softness and a great flow that gives extreme smoothness to any fine finish—including top-grade enamels, as well as varnishes. 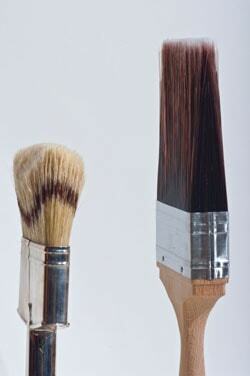 Note in the photographs how much shorter and bulkier the clear-finish brushes are. These are particularly fine examples, and the bulkiness serves to help hold thin material such as shellac or Danish oil. The bristles are as flexible, maybe more so, as the longer-bristled brushes, both synthetic and natural, designed to hold heavily pigmented coatings. Flags are just visible on some tips on this Chinexbristle brush. 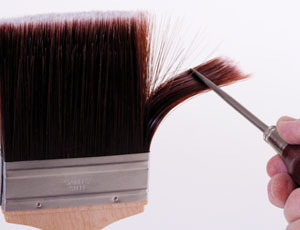 On synthetic-bristle brushes “flags” are added to the tips to simulate the ragged ends of natural bristle, so the brush holds more paint and releases it without brush marks. 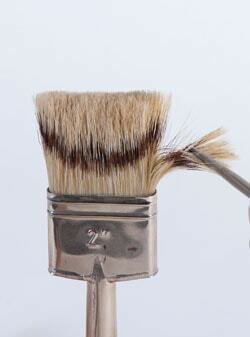 Natural bristles used in brushes have flags, or small deviations, at the tip, that aid in laying paint down smoothly. Such top quality synthetics as Chinex have flagging as well to nearly equal the performance of most natural bristle brushes. Select your brushes with the above materials and features in mind, and your coating jobs will be easier, faster and much, much better. Clean all brushes as soon as possible after use. Lengthy soaking in solvents, whether alcohol, water or paint thinner, is rough on the bristles. If you must stop in mid-job without having time to clean up, store the brush in a sealed one-gallon plastic bag in the freezer of your refrigerator. I also like to wrap the bristle end in aluminum foil. Use the proper solvent for the coating used. Clean, soapy water is best for water-based paints, while mineral spirits or paint thinner works well for oil-based coatings. Use alcohol for shellac. For water-based jobs, start with the soapy water and work it well into the bristles to loosen any paint. When the water bath is finished, use a pail of clean water to rinse. Repeat the rinse. If you’re still getting residue, repeat the wash and rinse again. For oil-based jobs, use the correct solvent, dip the brush and work the solvent through the bristles. You may wish to wear nitrile gloves for this process. Repeat in clean solvent until the brush leaves no residue. Spin the brush handle between the palms of your hand after cleaning to get rid of excess solvent or water. A mechanical spinner is a good extra tool. Use a brush comb to separate and straighten the bristles after cleaning. The comb also removes any bits that might cause the bristles to stick together. Store brushes flat to dry. Once dry, brushes are best stored by hanging, keeping tips free of obstructions. Protect from dust with a piece of painters’ film draped over the hanger. 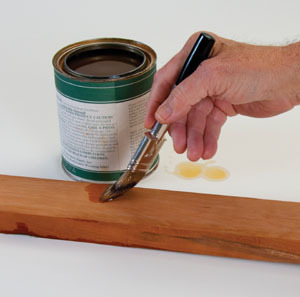 For brushes used with oil-based paints, dip the bristles in raw linseed oil before using again. This restores life to the bristles.